We’re not saying we were gifted as children. In fact, some of us at halloweencostumes.com did so poorly in elementary school that we even managed to fail lunch. Even so, we’re willing to bet we could tell the difference between our sweet old grandmas and an actual honest to god wolf. Well, that is, unless the wolf was really convincing. Or we forgot our glasses. Or we just weren’t feeling it that day. We take it back, the wouldn’t have stood a chance, but that still doesn’t give Little Red Riding Hood an excuse. 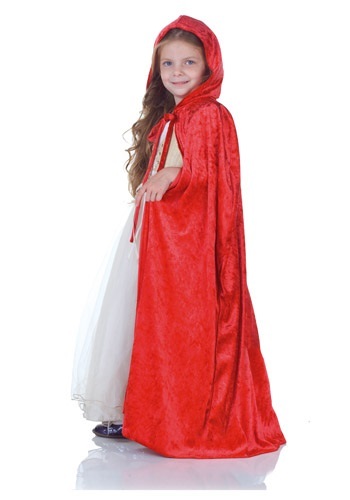 Our child’s Red Panne Cape is the central element for any Little Red Riding Hood costume. Your kid will love the high quality flowing fabric and the secretive hood. This cape is perfect for a Renaissance costume too, or even for a witch with a touch of flair!